The Turkish Press reports that the IYI Party is suggesting that the government seize the country’s Trump Towers and nationalize it. The threat shows the opposite of the emoluments problem– Trump is liable to economic blackmail because he refused to put his wealth in a blind trust. Turks are angered because the Trump administration placed sanctions on Justice Minister Abdülhamit Gül and Interior Minister Süleymen Soylu, over the imprisonment of American Christian missionary Andrew Brunson. Brunson is accused, bizarrely, of being involved in the July 15, 2016 attempted military coup and of being a spy (Turkish president Tayyip Erdogan has become increasingly paranoid and authoritarian in the past three or four years). Although the response is a little unlikely to target the Trump properties in Istanbul, Turkey says it is preparing economic retaliation for the US sanctions. The feud has forced the Turkish lira down to 5 to the US dollar, a historic low. Turkey is a NATO ally, and it is unusual for the Department of the Treasury to place cabinet members in an allied country under sanctions. The US leases the crucial Incirlik Airbase from Turkey, and supplies most of Turkey’s weaponry. A spokesman for the IYI Party, Aytun Çıray, also called on President Erdogan to cancel an $11 bn purchase of US airliners. IYI is a rightwing secular nationalist party that hived off from MHP. Erdogan has come more and more into conflict with Trump as he has grabbed more power in Turkey. He objects to the US military alliance with Syria’s leftist Kurds against ISIL, worried that US training and arming of the Kurds will spill back over onto southeast Turkey, which is heavily Kurdish and was the scene in the last third of the 20th century of an infamous dirty war between the Kurdistan Workers Party and the Turkish military. Erdogan insisted on taking Manbij, a north Syrian town that the Syrian Kurds liberated from ISIL with the help of US special forces embeds. They were forced out in the face of a Turkish military intervention in northern Syria, which has involved ethnically cleansing Kurds and replacing them with displaced Arab fundamentalists defeated by the al-Assad regime, who are allied with Turkey. Had the US and its Kurdish allies not blinked, the move could have led to an intra-NATO firefight for the first time in history. Erdogan is also extremely angry over Trump’s recognition of Jerusalem as the capital of Israel. Erdogan is at least rhetorically a big supporter of the Palestinians, who claim east Jerusalem as their future capital. 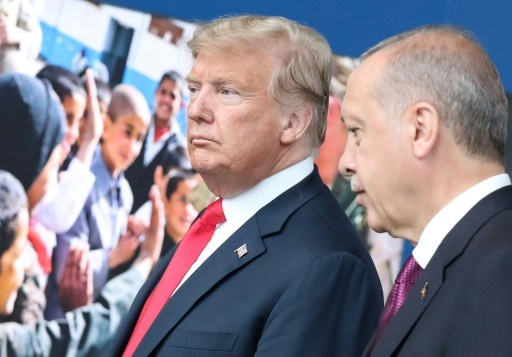 So far, the tensions between Washington and Ankara have been manageable, but there is always a danger of escalation when two former allies begin targeting one another. Featured Photo: POOL/AFP/File / Tatyana ZENKOVICH. US President Donald Trump and Turkish counterpart Recep Tayyip Erdogan met during a NATO summit in June.